Namibian President Hage Geingob will grace the official opening of this year’s Agriculture and commercial show on the 30th July, 2016. Dr Geingob is expected to arrive in the country on Friday July 30, for a two days official visit. And President Edgar Lungu is expected to hold private bilateral talks with the visiting Namibian Head of State as well as host a state banquet in his honour. 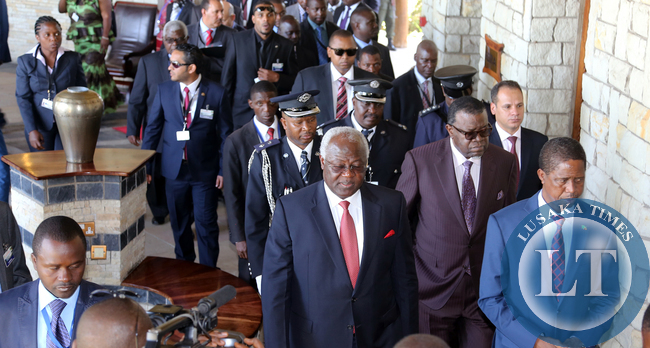 President Geingob‘s visit to Zambia is significant as Nambia is one of the countries important neighbours with relations that have continued to grow over the years. Dr Geingob’s visit is expected to strengthen bilateral cooperation in various economic and social sectors between Zambia and Namibia. This year’s Agriculture and Commercial show is being held under the theme “Managing the Environment for Growth”. This is according to a statement issued to ZANIS in Lusaka today by Ministry of Foreign Affairs Public Relations Officer Dorcas Chileshe. A respectable president from Namibia and you offer is rhumba music by Werrason???? PF government is so insulting.